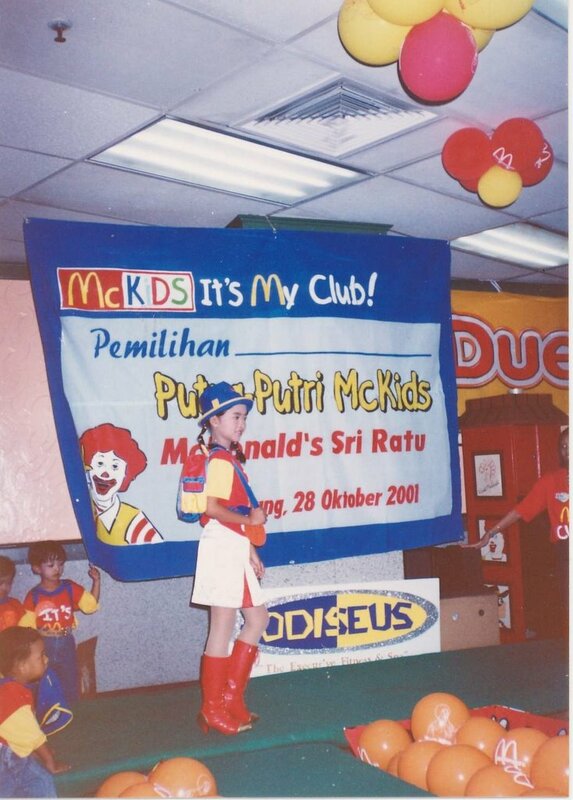 This picture was taken on October 28 2001 when Angie joined a modeling contest at McDonald’s restaurant in Semarang. The name of the event was “Pemilihan Putra Putri Mc Kids”. It was one of the most memorable contests she joined. 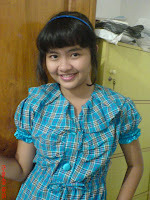 Angie belonged to category B, for children who were in the fourth, fifth, and sixth grade of elementary school. 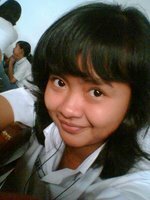 She got number 13, a number that was not really well-liked by Javanese people coz people believe it as an unlucky number. In fact, the boots were very tight for her feet and legs so that she didn’t feel comfortable when wearing them. They must have disturbed her walk on the catwalk. When the announcement of the winners was done, she was sitting on her instructor’s lap while I was somewhere else. There were three winners for each group; three winners in girls’ group in each category; and also three winners in boys’ group. After all winners were called to the stage, Angie wasn’t included into those winners. I was broken hearted. My sister who was with me seemed disappointed too. I couldn’t imagine how Angie felt at that time coz I didn’t see her in the middle of so many people. I know in a contest, there is always the winner and the loser, or well, the one who is not lucky to be the winner. Angie had experienced to be “unlucky” too several times before that. But still, I couldn’t avoid feeling broken hearted and disappointed. However, then, the MC said, “Besides those winners, there is still one winner, that is favorite winner. And the trophy goes to the contestant number 13 from category B.” Gosh … suddenly my heart was not broken into pieces anymore, LOL, the pieces were directly back into one full heart. LOL. Angie went to the stage to get her trophy and also some other gifts from the sponsors. Her face looked so radiant and excited. I was so proud and happy to see her at that time. At home, she told me after the winners were announced, she was sitting on her instructor’s lap. She was broken hearted too at that time, almost fainted, she said. LOL.